I remember the first time that I met Tom Fletcher, the director of Nottingham Analogue Studio. It was several years ago at the CES. I was meandering through the rooms hosted by Audiophile Systems, the distributor of many well-respected lines, including Arcam, Nagra, dCS, and Nottingham Analogue turntables. Just as I was about to leave I happened to catch a glimpse through the doorway of a small adjoining room. Inside I noticed a dapper-looking gentleman with a big smile on his face, who appeared to be doing a bit of "air-band" conducting while a glorious concerto was playing in the background. It was his obvious sense of enjoyment that halted me in my tracks and made me turn around to discover what was giving him such pleasure. He immediately took notice that I was from Kansas City and launched into a fascinating discussion on the importance of Kansas City in the jazz scene and talked about some of the greats, from Count Basie to Charlie "Bird" Parker and Duke Ellington. Indeed, I must have been in that room talking about music for ten or fifteen minutes before I even realized that this gentleman was not just an admirer of great jazz musicians, but the director of Nottingham Analogue Studios, a manufacturer of some of the best analog gear in the world. Tom Fletcher would probably take issue with my use of the phrase "just an admirer of great jazz musicians," as if I were implying that this was a less important part of who he is. To Fletcher, who has been making turntables for over 40 years, its all about the music. Since that day, Ive talked to Tom Fletcher many times, and our conversations always start the same way. This year it was Horowitz and Chopin, last year it may have been Louis Armstrong, but its always the music first and then, if youre patient, you might get him to talk about his latest product. OK, so Im a fan of this stuff. I admit it. I like the man. I like the philosophy. I like the 'tables. They make music. Apparently our clients like them, too, because Nottingham turntables are largely the reason for turntables outselling CD players in our store over the last twelve months or so. Go figure. So what makes Nottingham 'tables so special? Tom Fletcher likes to use the phrase "magnificent marriage of materials." He says it's not so much each individual material, but how each material gets along with the others. 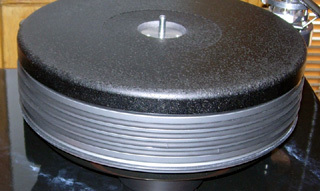 First of all, Nottingham turntables use heavy alloy platters. Many manufacturers are opting for the use acrylic these days. Its pretty, its easy to work with, and its cheap. Acrylic does some things pretty well. Its dense and can be machined quite flat. Records played on acrylic platters have a quick, dynamic sense about them. They also tend to be noisy. Surface noise seems to be more exaggerated. I also sometimes sense a slight glare with acrylic. The soft alloy platters of the Nottingham 'tables are quite heavy. Heavy can be a good thing. They act like flywheels and keep the speed rock steady. The edges of the platters are damped with elastomer rings to eliminate any chance of ringing. Its that "marriage of materials" thing. Nottingham was one of the first manufacturers to go "plinthless." Having a large rectangular plinth only increases the area for picking up resonance, acting essentially like a microphone. Less plinth, less vibration, more quiet. Each Nottingham turntable comes with a base to set the 'table on for a more conventional look. Users are free to experiment with other options, including air bases like the Seismic Sink or slabs of granite. Go crazy. Motors are isolated from the 'table and are extremely low torque. Belts are fairly substantial rubber O-rings. All Nottingham 'tables require a push of the platter to get them moving. The motor has just enough power to keep the rotation stable without adding any unnecessary resonance. I have to say that theres something therapeutic in touching the edge of the platter and giving it a spin. Just the ticket for relieving that digital migraine. All Nottinghams share a similar sonic signature. The music jumps from a very quiet black background. The 'tables seem to have very little sound of their own. They are very revealing of whatever is put in front or behind them. They are very, very good at the rhythm factor. Many a time have I caught the customer tapping his toe. And then theres that space thing. Im sure its part of the quiet nature of the deck, but the Nottinghams are almost scary when it comes to suspending images in their proper space (with lots of air around them). When you move up the line you gain quantity of the same qualities. So what does it cost to get into a Nottingham? You can get into a 'table with tonearm from anywhere between $1199 and $38,499. All 'tables can be ordered without an 'arm or set up to take the 'arm of your choice. Its very hard for me to call the Horizon and Horizon SE entry-level turntables. 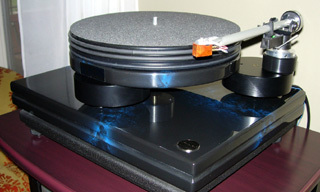 At $1199 and $1499 including a Rega RB250 'arm, they fit the category. Performance is something altogether different. This has been a very hot product for us. I have sold these 'tables to people who owned Linn LP-12s, VPI Aries, and Oracles. Im not saying that they used to have these 'tables years ago and are now getting back into the vinyl thing. Im saying that they took a Horizon home, compared it to these 'tables, and preferred it to them. The Horizon has a hefty 11-pound alloy platter that sits in very narrow beam. Attached to the beam is an armboard in which sits the Rega RB250. 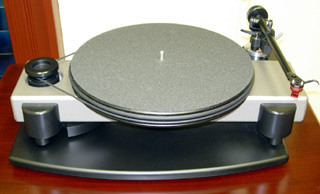 The Rega is a natural with this 'table and allows an almost infinite number of upgrades. We encourage people to step up to the SE model for very good reason. The non-SE model has the motor attached to the beam. For the additional $300 the SE adds an isolated motor pod that greatly reduces resonance and is a no-brainer for the added cost. 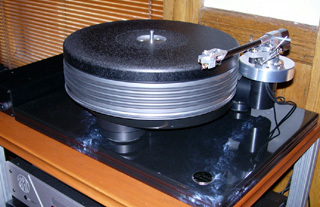 The Dynavector 10X5 high-output moving-coil cartridge is a synergistic match for this 'table. I believe that the synergy has a lot to do with its over-achieving ways. Moving up in the line is the Space Deck at $2999 with the Ace Space tonearm. It is the greatest-selling model in the line with over 10,000 units around the world. It has an elegant look to it, with the platter mounted in a round sub-base suspended by three round pods. The base is finished in a very attractive faux marble. The platter is much heavier on the Space Deck, and there is the ability to add a second 'arm. The Ace Space is a unipivot design with a carbon-fiber shaft. The 'arm is easy to set up and offers a presentation that errs on the warm side. If your tastes lean toward a more lively sound, I suggest the Origin Live Silver 'arm (my favorite). The Space Deck offers a couple of upgrades for those with the cash and ambition. A Heavy Kit ($1000) adds a thick graphite-fiber slab to the top of the platter for even greater mass and isolation. The Wave Mechanic Power Supply ($1299) gives a clean, stable power supply to eliminate those nasty AC fluctuations. I am personally on my second Space Deck (there was a change in the model, so I moved up to the new version) and have never looked back. I have not had a Hyperspace in the store, so my comments are limited to how it differs. The Hyperspace platter is even heavier. You move up to a grooved bearing that actually pulls a thin layer of oil between the spindle and thrust plate as the platter spins. This makes for an extremely quiet bearing assembly. The Heavy Kit is included as standard. Price is $5499. I recently set up the $8499 Dais in the store. Assembling the platter almost took out my back. The platter weighs nearly 50 pounds. It is made of gravity-spun iron, which eliminates even the smallest of air pockets when casting. Included with the 'table are a couple of handles that actually thread into the platter assembly for lifting it in place. The entire 'table pushes 100 pounds. Both the Wave Mechanic Power Supply and Heavy Kit are standard. The speed stability of this 'table is amazing. There have always been those who preach that speed stability, on even the most minute level, is of greatest importance with analog. This 'table will make you a believer. There is a naturalness about the music that I can only attribute to the absolute rock-solid speed stability of this unit. There is a model above them all called the Deco. It is Nottinghams piece de resistance. At $38,499, the Deco is the result of starting from ground zero with an unlimited budget in mind. It weighs in at 140 pounds and has a platter that resembles a cut diamond. The shape is said to spread resonance frequencies over a wider spectrum, making them easier to eliminate. A complex motor assembly allows the user to make minute changes in the current reaching each side of the motor armature. There are many other technical designs that I have neither the space nor physics background to explain. What impressed me when talking to Tom Fletcher about this 'table were the similarities that it shares with its less-esoteric brethren. The soft alloy platter and the use of elastomer damping rings is a common Nottingham design. Fletcher said that he tried everything else and came back to the same thing. If its right, its right. During my visit to CES this year, a stop by the Nottingham room was at the top of my list. As I walked in the room, there stood Tom Fletcher in front of his new statement turntable, the Deco. Yes, in time I did get Tom to rave on a little about this new artistic analog creation. First, however, I got to hear Tom speak of Vladimir Horowitzs last recording of Chopin at age 86. As the music filled the room, Tom was not listening to a nearly $39,000 technical marvel. He was sharing the final fingerings of a octogenarian master. What audio equipment could hope to compete?